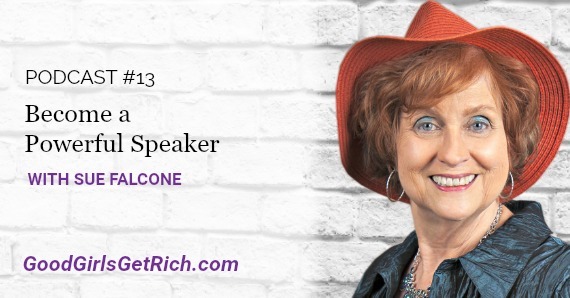 This week, Good Girls Get Rich features guest, Sue Falcone, CEO at Remarkable! A Speakers Bureau blog. Remarkable! A Speakers Bureau was founded by CEO, Sue Falcone, who recognized the need for a speakers bureau that would represent professional speakers, and provide the perfect speaker for clients who sought the best for their events with a personal “hands on” custom touch. As a former corporate executive who hired outside speakers and trainers, to becoming a professional speaker and author being hired, and now to creating a distinctive and unique speakers bureau representing speakers for hire, she has gained the experience and expertise needed to give a full service experience. This invaluable experience gives her an advantage in the industry of being able to provide consulting services in addition to selecting the best speakers to represent. all at no extra charge to her clients. An interview with Sue Falcone, CEO at Remarkable! A Speakers Bureau blog. What should the professional speaker’s business plan contain?